This is a friend of mine and he is a full time working cowboy on a ranch here in Montana. 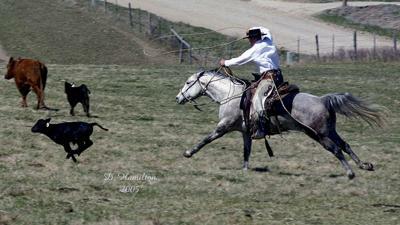 It was time for doctoring and this little calf sprinted out and Chris took off at a dead run. I was just hoping that I got him and the calf in focus and was thrilled with the action in the photo. I am a equine photographer and love it when I capture real action.